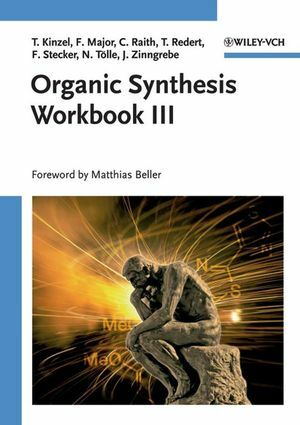 Based on recent successful natural products syntheses, the Organic Synthesis Workbooks series provides a clearly structured, well explained step-by-step guide to train modern reactions of organic synthesis, thereby combining fundamentals with latest advances in synthetic chemistry. The exceptional, didactical unique problem/solution style makes it a valuable must for any interested organic chemist. Each problem is clearly divided into key reactions and detailed explanations with rapid cross-references providing substantial assistance in solving synthetic problems. "The brevity and clarity of style, and the clear layout all contribute to ready assimilation. Mechanims are provided in a way that leads to a clear understanding of the major principles. Any organic postgraduate student can gain much from this book, and should own a copy." Tom Kinzel started studying chemistry at the University of Goettingen, Germany, in October 1998. After staying in the Peoples Republic of China in 2001/2002 studying Chinese at the University of Nanjing and joining the working group of Prof. Henning at the Chinese Academy of Sciences in Shanghai, he returned to Goettingen and received his diploma in Chemistry in July 2004. He is now a doctoral researcher in Göttingen. His research deals with the elucidation of reaction mechanisms by both theoretical and experimental means. Felix Major started studying Chemistry at the University of Goettingen, Germany, in October 1998. After joining the group of Prof. Clayden at the University of Manchester for 3 months in 2002 he returnded to Goettingen and accomplished his diploma in September 2003 under the guidance of Prof. Tietze. He is now doing his doctoral research in the same group focusing on the synthesis and biological evaluation of prodrug analogues of the antibiotic CC-1065 for a selective treatment of cancer. Thomas Redert started studying chemistry at the University of Goettingen, Germany, in October 1999. After staying in the United Kingdom in 2002/2003 at the University of Newcastle upon Tyne and joining the group of Dr. J.G. Knight, he returned to Goettingen and received his diploma in chemistry in July 2004. He is currently a doctoral researcher at the University of Goettingen. His research deals with the application of Palladium-catalyzed dominocyclisations for the synthesis of natural product analagues. Florian Stecker received his diploma in organic chemistry from the University of Goettingen, Germany, in July 2004. He started studying chemistry in Goettingen in October 1999 and worked at the Université Pierre et Marie Curie (Paris VI) under the direction of Prof. Max Malacria in 2002/2003. Shortly thereafter, he joined the group of Prof. Tietze (Goettingen) where he is currently a doctoral researcher. He is committed to the Palladium-catalyzed domino-Wacker-Heck reaction for the enantioselective synthesis of vitamin E and other closely related chromanes/chromenes. Julia Zinngrebe started studying chemistry at the University of Goettingen, Germany, in October 1998. After joinging the group of Prof. Clayden at the University of Manchester for 3 months in 2002 she returned to Goettingen and accomplished her diploma in September 2003 under the guidance of Prof. Tietze. She is now doing her doctoral research in the same group and works in the field of Palladium-catalyzed domino-reactions for the enantioselective synthesis of vitamin E.
MARKET: The book is aimed mainly at advanced students and lecturers. TWO SUCCESSFUL COMPANIONS: Organic Synthesis Workbooks I and II sold very well. STRUCTURE OF THE BOOK: The problem/solution style helps both in the training of synthetic methods and provides explanations for the used reaction type. TOPIC: Knowledge about organic synthesis is urgently needed for several examinations at university and throughout the thesis in organic chemistry.